Thematic parallels can appear and recur in film festivals. The 2018 edition of the Sundance Film Festival, which can be spliced in various ways under the umbrella of the common themes and topics it delved into throughout its 10-day run, is no exception to this. There were films that crossed paths with #MeToo. There were others that bravely analyzed racism and police brutality. But beyond these anticipated and necessary topical threads, something unexpectedly sweet also percolated. A curious subgroup of movies across the festival’s various sections told stories of single fathers and their young daughters, with an absent mother whose presence lingered on the background. So, for fun and a little change of pace, why not look at these films as part of a whole in the way they address the challenges of single parenting and the burden of growing up? In Debra Granik’s “Leave No Trace,” we follow a modern-day father-daughter, Will and Tom played by Ben Foster and Thomasin Harcourt McKenzie, unconventionally living off-the-grid near a reserve in Portland, Oregon. As Granik patiently establishes their routine within a unique life style—which includes gathering food, cooking, studying, playing chess and practicing drills for running away from authorities—we get a clear sense that Will, a war veteran, is as good a father as he can be under the circumstances. Profoundly caring about Tom’s well being and raising her with firm principles, Will still can’t commit to integrating into the society in any conformist sense while suffering an alienating, severe PTSD. In Granik’s film, we deeply feel both the loving, familial intimacy between the duo and the slowly surfacing tension, as Tom starts questioning their life style once they get captured by the state police and placed in a farm with temporary comforts. Will understands the inevitable would one day arrive, yet can’t resist denying Tom the everyday conveniences other kids her age have access to. In the quietly observed “Leave No Trace,” anchored by stunning performances by both Foster and McKenzie, Granik delivers a lyrical statement on the bonds that complete or estrange human beings and on familial ties we are born into or make for ourselves later in life. This gentle, miracle of a film is almost an antidote to Matt Ross’ “Captain Fantastic,” a 2016 Sundance title that explores similar themes in a comparatively showy, crude fashion. In comedian and debuting writer-director Bo Burnham’s “Eighth Grade,” young troubles find the thirteen-year-old Kayla Day (Elsie Fisher, terrific in playing two parallel, online vs. offline roles) and reflect onto her concerned father Mark (Josh Hamilton). Kayla is a typical kid of her generation: addicted to her phone and frequently wasting time on social media, while ignoring her father’s friendly attempts to have a sincere, real-life connection. The horrors of the in-between, final middle-school year seem scarier for Kayla than for most of the other kids around her. Despite what her self-assured YouTube videos, through which she offers free advice to anyone who’s willing to listen (on topics like “how to be confident” or “how to put yourself out there”) might suggest, she can’t escape her awkwardness, loneliness and unpopularity amongst the cool kids of her school. All that briefly changes one day, when Kayla befriends a compassionate senior she is supposed to shadow, for smoothly transitioning into the upcoming high-school year. But even this welcome change of pace brings on new troubles into Kayla’s life, like the predatory sexual interest of a guy several years older than her. While she spends much of the movie in isolation (hiding her crushes, youthful appetites and real-life nightmares from her father) the clouds eventually part for Kayla in one charming scene, that allows her to bond with her father like she’s never had throughout the film, even hinting at the departure of her mother in a touching manner. It’s no surprise that Brett Haley, the director of the lovely and unassuming “I’ll See You In My Dreams” made a film as warm and intimate as “Hearts Beat Loud,” a casual, keenly observed story of a Brooklyn father and daughter, charged with a kind of music as free-spirited as the duo is. 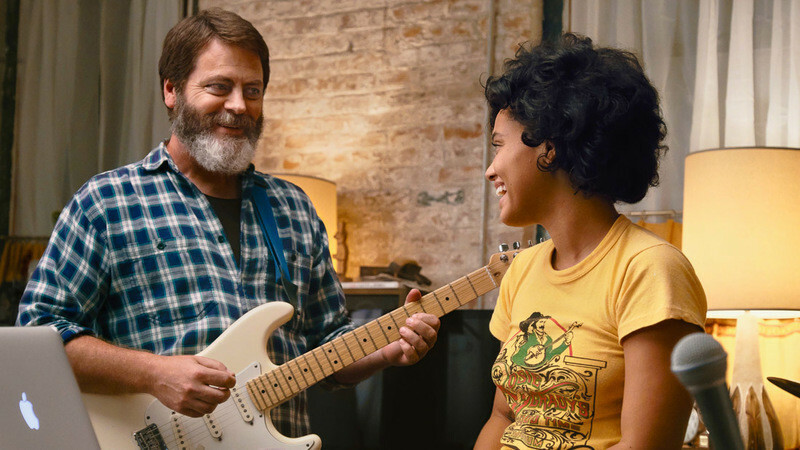 A departed, much beloved mother figure is engrained everywhere in the bohemian lives and Red Hook apartment of Sam and Frank (played by Kiersey Clemons and Nick Offerman with great chemistry), as they practice music and reminisce about life together. While they appear closer to one another than the father-daughter of “Eighth Grade”, Sam and Frank certainly withstand their own share of problems. Facing the impending shuttering of his neighborhood gem record store, Frank insists on starting a band with his talented singer-songwriter daughter (the film boasts an incredible soundtrack), discouraging her West Coast medical school plans. Yet Sam, despite having started a new relationship on her own (love interest is played by Sasha Lane), plans to move away at all costs to avoid a musical career. (“Not becoming like dad” is an unspoken goal.) When one of their jam session songs becomes a Spotify hit one day, they adopt Sam’s protest-filled words “'We Are Not A Band,' dad” as the name of their ensemble, before they eventually exchange farewells with acceptance. “Hearts Beat Loud” gently charts the last days of this parent-daughter’s togetherness pre-college, as both of them learn to let life take its course. 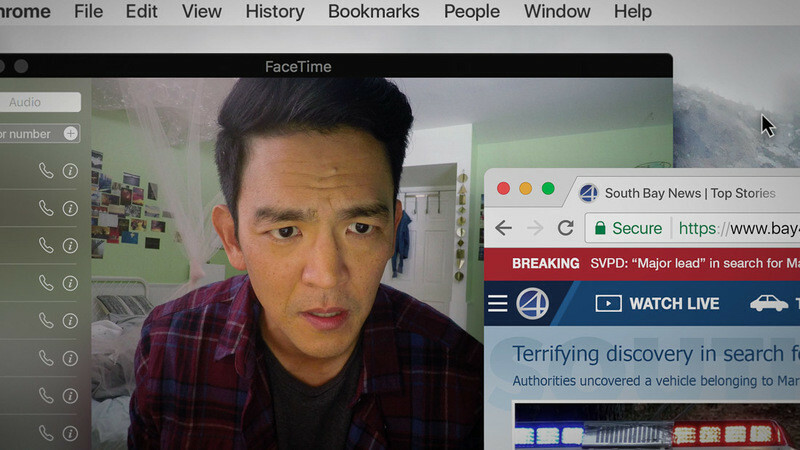 Few dads among Sundance fathers have a harder time than David (John Cho) in “Search,” an original blast of a film from debuting writer-director Aneesh Chaganty that takes place entirely inside computer and smart device screens. (If you’re thinking of Levan Gabriadze’s horror flick “Unfriended” at this stage, you’re more or less on the right track.) After a prologue that wouldn’t be out of place in Pixar’s “Up,” we take a speedy look inside the family life of David, as he and his wife Pamela welcome a child (Margot) and raise her together for a decade, until Pamela loses the battle to cancer. Cut to several years later through a montage, and we meet the older Margot, who has grown up to be a kind, caring young girl, a piano enthusiast and a bit of a loner at school. Ignoring all her father’s emails and text messages, she one day mysteriously disappears into thin air. Her case becomes a nationwide mystery with the hashtag #FindMargot. Through social media accounts, emails, text message files and various other clues hidden inside Margot’s digital footprint, David tries to crack the case of his daughter’s disappearance with the help of a dedicated cop, played by Debra Messing. There wouldn’t be any point in revealing the outcome of the quest other than spoiling the suspenseful fun, but in the end, “Search” heartily implies we instinctively know our dearest family members better than we sometimes give ourselves credit for, even when the evidence insists otherwise. In fact, all four of these films that observe the concealed, one-of-a-kind connection between fathers and daughters are charged by the same lesson, in their celebration of dads and their little girls, who lean onto each other in order to move forward in life as free individuals.